Teardrop Flags Printed in Full Color One Side on 3oz Polyester Fabric with Indoor or Outdoor Stand Available in Sizes 7ft, 9ft, 11ft, or 14ft. Printed in Full Color One Side on 3oz polyester fabric. Sizes 7ft, 9ft, 11ft, or 14ft. Available with choice of indoor or outdoor stand. 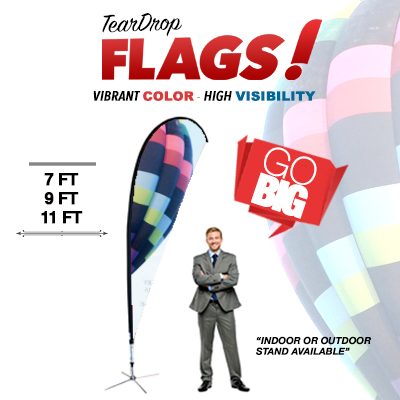 Teardrop Flags: Demand attention with our uniquely shaped Teardrop Flags. In addition to being printed in full, vibrant color on one side, your 3oz polyester flag has a distinctive shape to catch the eye of passers-by. With your choice of an indoor or outdoor stand and sizes of 7ft, 9ft, 11ft, and 14ft, you can customize your flag to match your needs. Our Teardrop Flags are available in increments of 1, 3, 5, 10, and 25. Select between an indoor or outdoor stand. Replacement flags also available.